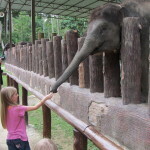 About 90 minutes northeast from Kuala Lumpur lies the elephant sanctuary at Kuala Gandah. Many elephants have been forced from their homes due to destruction of their natural habitat for farming. Elephants become accustomed to using the same paths their whole lives, and farmers don’t usually take well to having their fields trampled. Fortunately, it’s now illegal to kill the elephants, but many have been relocated to protected forests or to sanctuaries like this one. 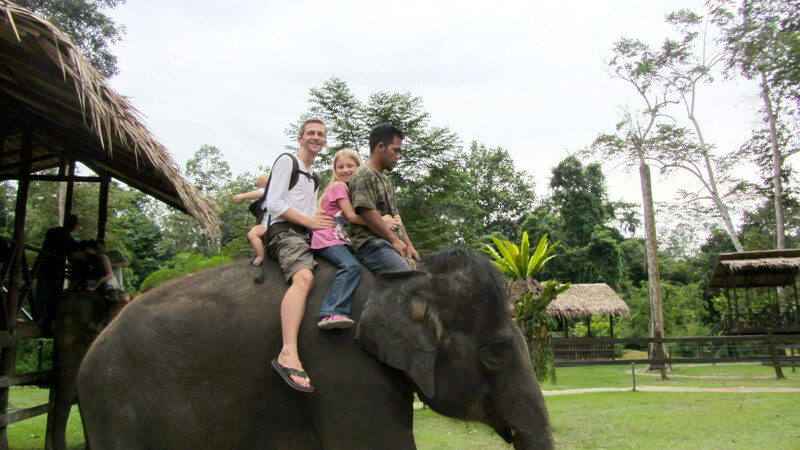 Moving a group of elephants is no easy task, for the humans or the elephants, but domesticated elephants like those in the sanctuary are used to encourage the wild elephants to move to their new location, often requiring a trip on a truck or boat. 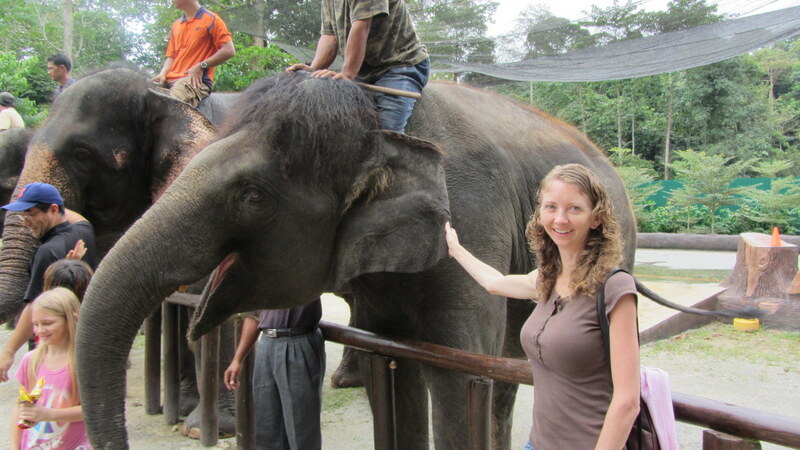 At the sanctuary, we watched a 30 minute video of the process, which mostly left me feeling frustrated about the destruction of the forests to create farms, and feeling sorry for the elephants who had to leave what was once their home. 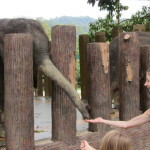 They also had a small museum where we learned about elephants and their abilities. 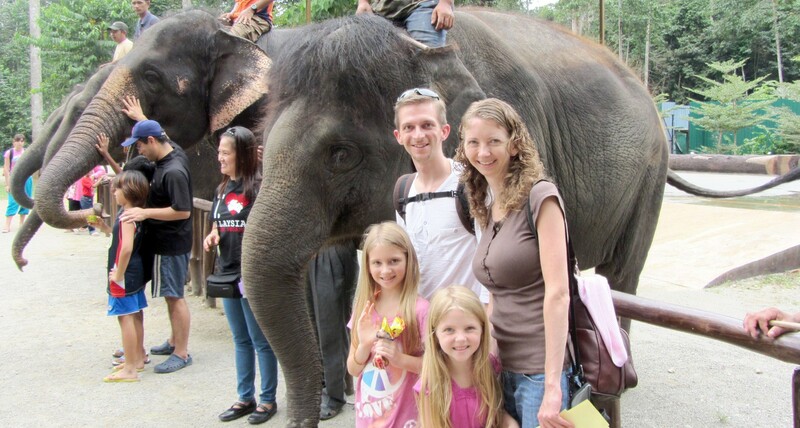 We enjoyed a nice lunch and then got to meet the elephants themselves. The babies were especially cute but all of them were fun to see. 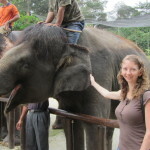 We fed them bananas, peanuts, and papaya, rubbed their trunks with love, and even got to ride them for a few minutes! We all enjoyed the ride except for Aysia, who cried the moment we put her on the elephant and didn’t stop until we took her off. We could have gotten in the water with them as well, but we didn’t want to get splashed by the workers like everyone else was. 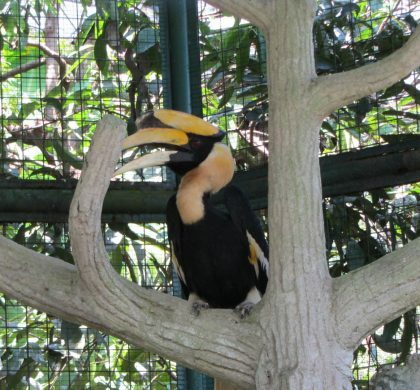 A visit to the sanctuary is free of charge, but donations are requested. 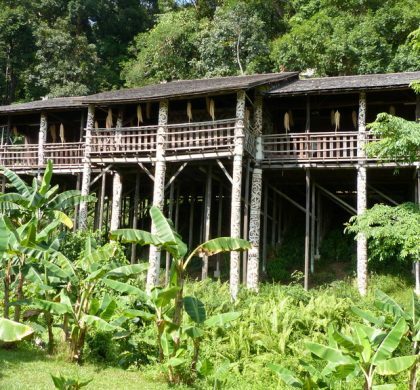 There is also no way to get there via public transportation, so you either need to rent a car and drive (that’s what we did), hire a taxi, or pay an overpriced tour company to take you there. 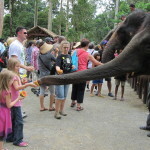 But we found our visit to the Kuala Gandah elephant sanctuary to be very enjoyable, educational, and worthwhile. 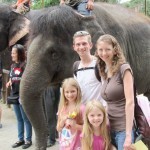 When you visit Thailand, as I’m sure you will, look into elephant ride tours there. 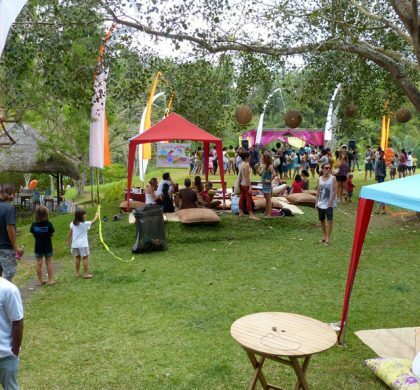 I know Margie and her family did one through the jungle…. was a highlight of their time there. 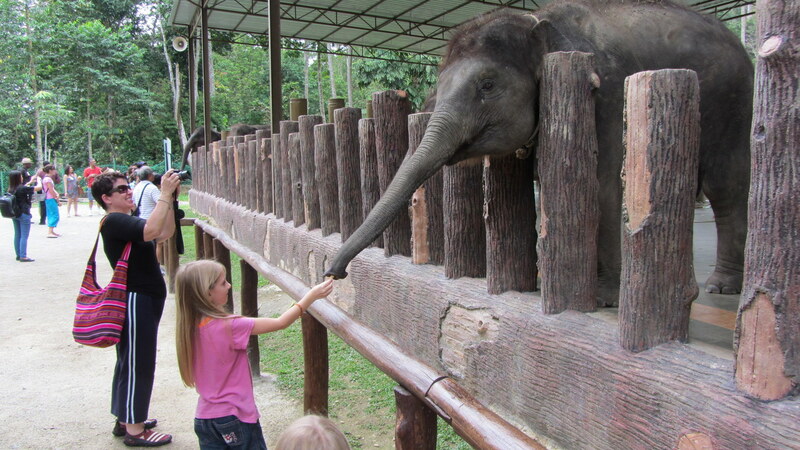 I really enjoyed visiting this elephant sanctuary. 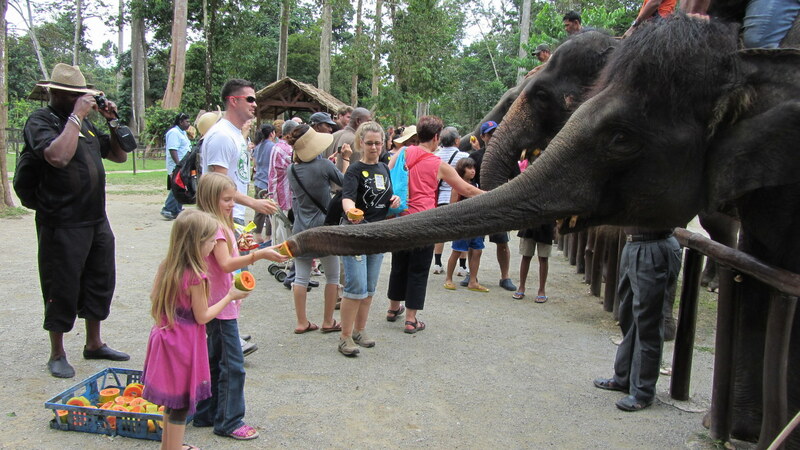 It was so nice to see all the sweet elephants, and a lot of fun to feed them too. I thought the museum was nice and very educational. 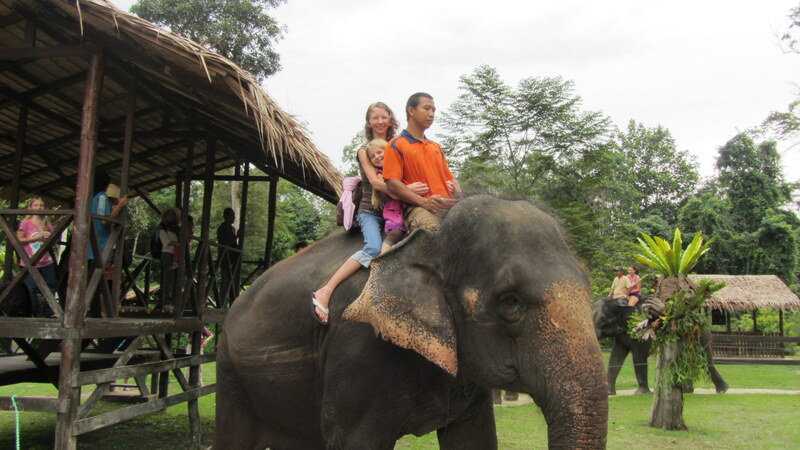 I’m not sure why Aysia didn’t like the elephant ride. 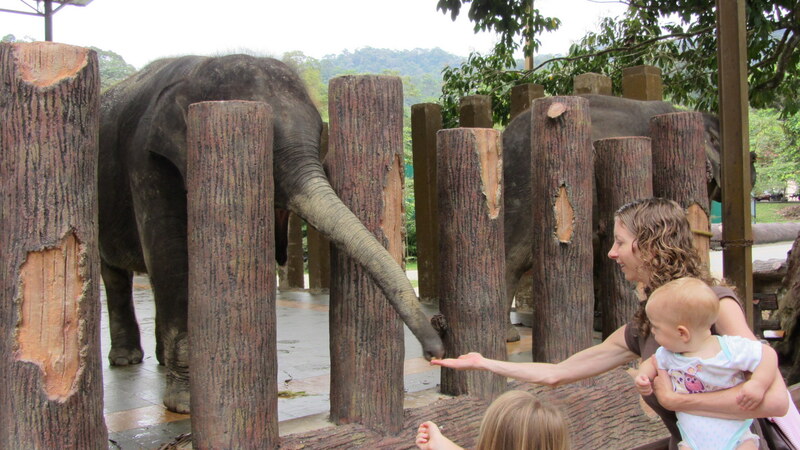 It may have had something to do with not liking the texture of the elephant touching her feet. She also cries whenever we attempt to stand her on the shaggy rug here in the living room of our apartment.